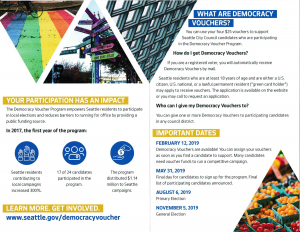 Next week the city launches another run of its Democracy Vouchers program, for the candidates in the seven district-based City Council elections this year. The SEEC administers the program on behalf of the city. According to commission staff, of the 40 candidates registered to run for office this year, 24 have enrolled in the program and two have already completed the qualifications (with one more in review). Vouchers are ready to be mailed out to 435,000 active registered voters next Tuesday, February 12th. 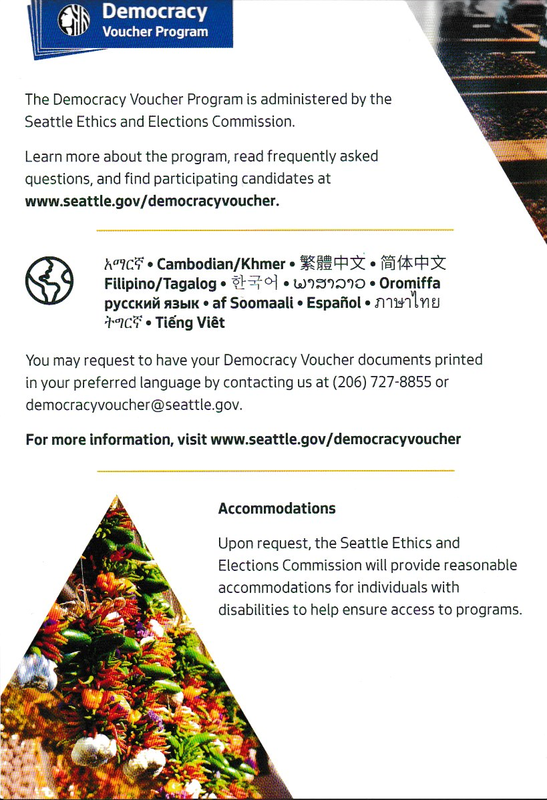 In addition, 30,000 inactive registered voters will receive a postcard with instructions for how to request vouchers. Staff expect vouchers to start appearing in mailboxes next Wednesday. 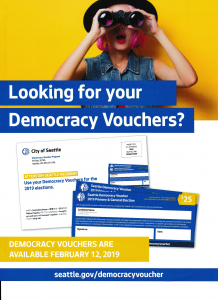 There is, however, one hiccup: the online portal promised to be available this year for voters to designate their vouchers to a qualifying candidate is not yet ready to go; staff expect it to open up for business on February 28th. 1:1 work with community-based organizations to ensure tha tthe word gets out. 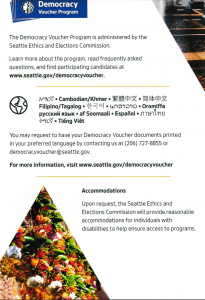 a brochure to educate new Seattle residents about the Democracy Voucher program (below). 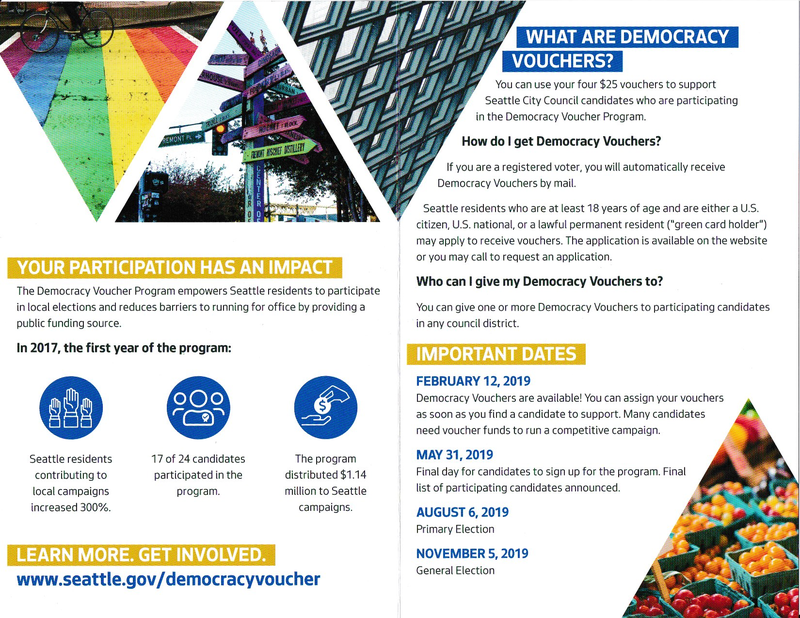 Monday I wrote about one of the agenda items for today: a discussion of what should be a considered a “debate” for candidates trying to qualify for the Democracy Vouchers program. To qualify, candidates are required to participate in at least three debates/candidate forums during the primary, and another three during the general election. But deciding which events count is tricky. On one hand, an event that only invites candidates from a narrow ideological range doesn’t serve the public’s desire to fully explore and debate ideas. But on the other hand, an event that includes all candidates could be unwieldy and in the end not terribly informative either (in the 2017 mayoral primary, there were 21 registered candidates). So where is the right middle ground? SEEC staff proposed that a qualifying debate would need to invite all candidates for City Council or City Attorney who have received contributions from at least 50 individuals, or for mayoral candidates at least 100 contributions. Commissioner Eileen Norton thought that number was too high, and worried that it would prematurely exclude candidates without prior name recognition who actually need the public debates to make an impression and gain supporters (and contributors). She suggested perhaps 20 was a better number. There was also concern that particularly early on in the campaign season the restriction would be problematic. On the other hand, several commissioners expressed a desire to give event organizers the ability to exclude disruptive candidates without any real support who wanted to use the public forums as free airtime. In the end, commission staff took back some homework assignments for a future meeting: looking closer at the number of contributions that past candidates have received to see if there are natural groupings, as well as possibly looking at the speed in which candidates received contributions to understand whether there are timing issues. Before a new rule on debates can be adopted by the Commission, it must hold a public hearing on the proposed rule change to allow members of the community to weigh in. 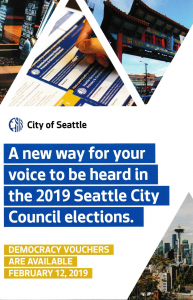 Perhaps the most interesting discussion this afternoon was driven by last month’s Seattle Times article detailing the role of a local firm that was a campaign consultant to Mayor Durkan in 2017 and now advises her and lobbies the city. A year ago former Murray aide David Mendoza pitched to the SEEC that it should enact some restrictions on lobbyists who double as campaign consultants. The SEEC never took that conversation forward, but have now found new energy behind looking into it. Commissioners emphasized that their first step should be to understand what other jurisdictions have done, in particular Los Angeles and San Francisco. They also expressed reservations about enacting restrictions, as that may run into First Amendment issues. But they were more excited about forcing disclosure, at least in ways that would more eaily allow for “connecting the dots” between campaign consultant work (which is only reported in campaign filings) and lobbying work (which lobbyists need to report). An initial suggestion was to add another line to the form that lobbyists are required to file, that requires them to list any prior or current campaign work. There was also some discussion about whether the current rules for lobbyists, which only apply to the city’s legislative process, should be extended to the rulemaking and regulatory work that executive branch departments do outside the legislative process. SEEC staff balked at that idea, however, concerned that it might explode the number of lobbyists and overwhelm the commission staff’s ability to process and track all the filings. “I don’t want to take a difficult system and make it worse,” said SEEC Executive Director Wayne Barnett. Commissioner Nick Brown suggested that there was a distinction to be made between large and small cities in their need to closely monitor and regulate lobbying activities within the executive branch — though he wasn’t sure where Seattle sat on that spectrum given its recent rapid growth. That position echoes comments previously made by Paul Ryan of Common Cause — who the SEEC staff said they expect to consult in the coming weeks. In the end, there was broad consensus among the Commissioners that increasing transparency was a good first step, and they sent their staff off to work up some proposals for how to accomplish that.